Last February I went to Illinois to visit my children for a week. Although most of the week was spent shopping (and eating 😊) we also went to Chicago on two separate days to visit a couple of their museums. 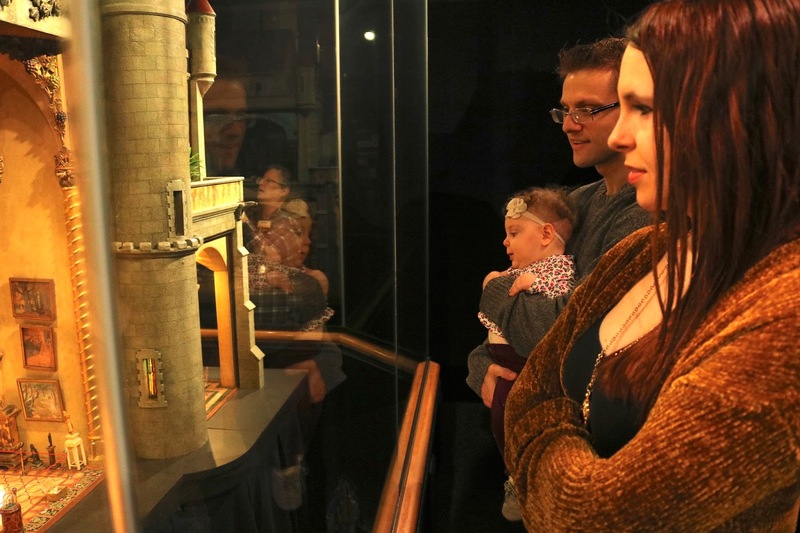 Throughout the calendar year, Chicago has free admission days for Illinois residents. We were fortunate to get free admission for my kids so all we had to pay for was the parking and little ole me! The historic buildings that most of Chicago's museums are housed in are noteworthy in and of themselves. They are so huge; quite the impressive monuments! The dome in the middle of the building serves as the centerpiece for the entire building. Just wait till you see what it looks like inside. This is the dome looking up from the inside. The design inside changes constantly throughout the day. This 'rainbow' was one of my favorites, but we also watched the sun and moon travel along the top of the dome too. This day was Alethea's first all-day outing so we were concerned how long she would last. Thus we made a plan to look at all the exhibits we really wanted to see in case we had to leave early. It turned out that our plan was a good idea, for even though Alethea was very good, this museum was so HUGE we didn't have the time to see everything anyway! When we arrived shortly after the museum opened, the first thing I did was look at the map to see all the exhibits. I saw the words "Colleen Moore's Fairy Castle" and my curiosity got the best of me. "What in the world could that be about?" I wondered. "Fairies, Castles, that sounds like my sort of thing!" So off we went in search of the castle. The castle was open on all four sides for viewing and encased behind glass. As you walked from one viewing point to another a recording comes on explaining all the details of what you are looking at. Colleen Moore was a famous silent film actress. 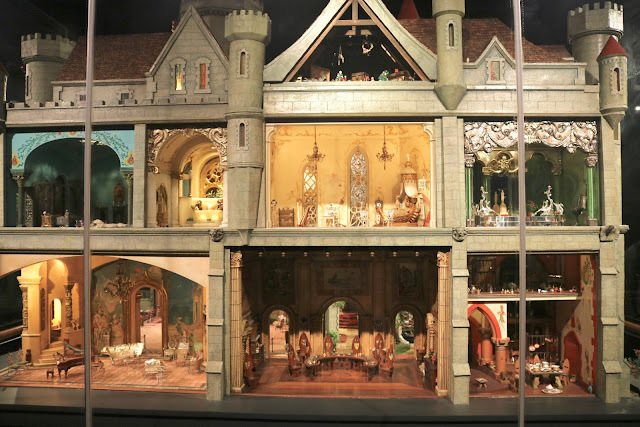 She spared no expense building this beautiful "doll house" and then touring the country during the Great Depression to raise funds for children's charities. There are items and room in this house made with real diamonds and gold! 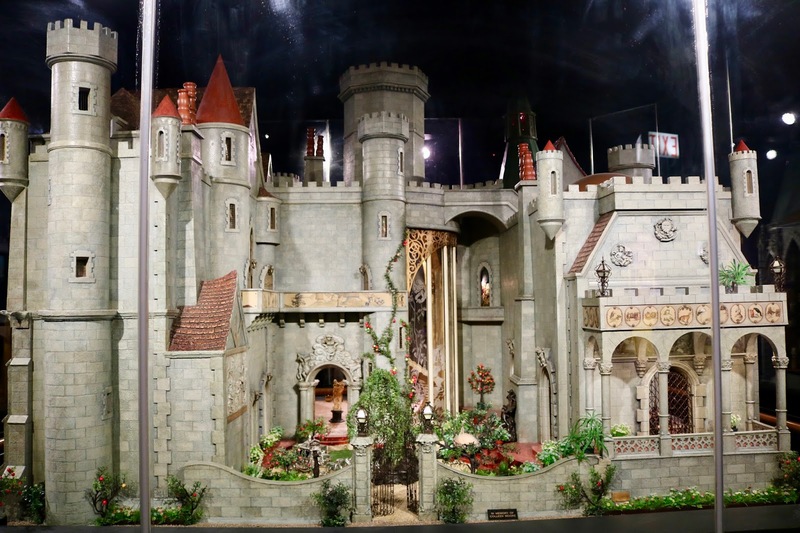 The price tag for this castle in 1935 was $500,000. There are no human figurines in this castle. It has a fairy theme where images from various fairy tales grace the walls. Walt Disney himself donated a full length portrait of Mickey and Minnie Mouse dressed as the King and Queen of Hearts. There are many items in this castle that are thousands of years old. You can read more about the details in every room HERE. One of the most popular exhibits in the museum is the "Science Storms" exhibit. When you see a live tornado simulation from the foyer as you enter, you can certainly understand why! 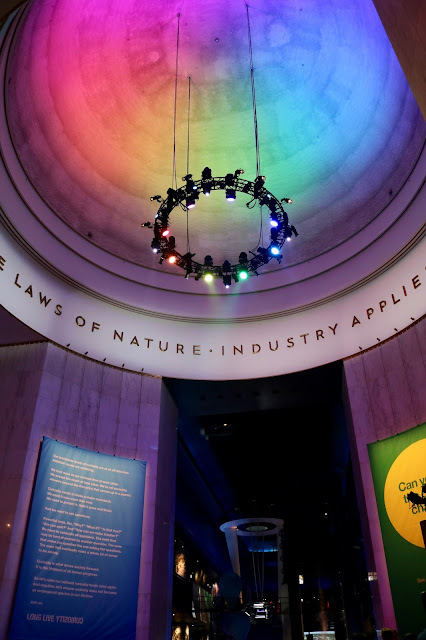 The best part of the Chicago Museum of Science and Industry is that they have many educators in the exhibits who engage with the audience, teaching them, and encouraging them to ask and answer questions. There was an educator at this tornado simulator teaching people how tornadoes are formed and the different shapes they can take. 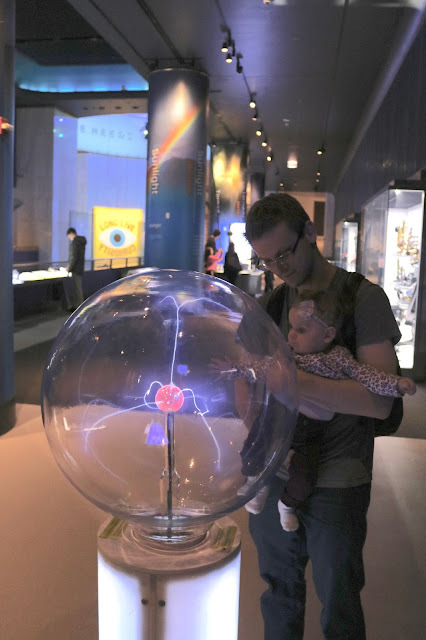 In this exhibit you can learn all about avalanches, atoms, lightning, fire, sunlight, tornadoes, and tsunamis. Here Alethea is trying to figure out how this ball is staying in the air all by itself! And here Alethea is again fascinated by electricity! 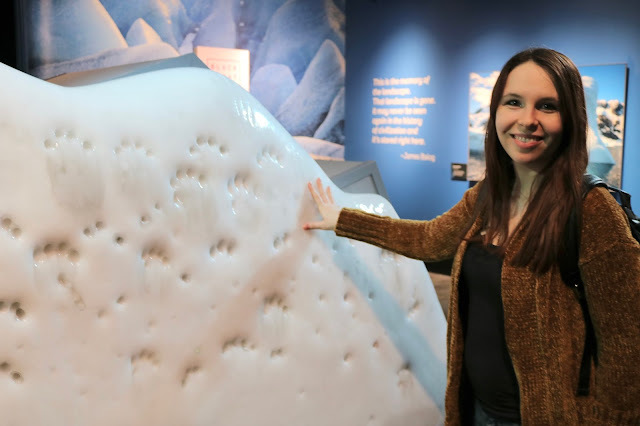 The "Extreme Ice" exhibit captures the pace of the world's glaciers melting. 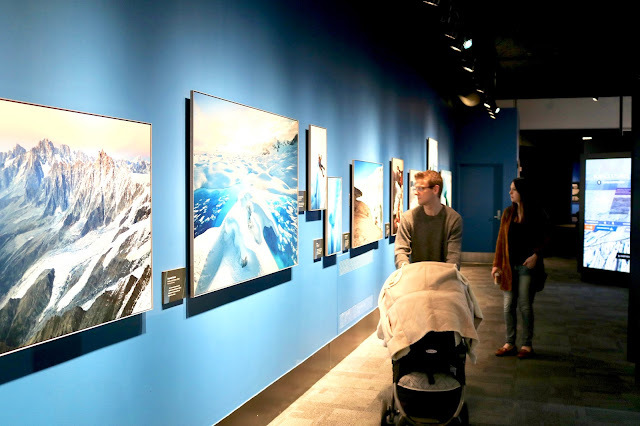 There is a short video you can watch when you first enter the exhibit, then you enter the rest of the exhibit to see photographs and explanations of what is happening to the glaciers. I don't know how they do it but they have a glacier that you can actually touch to feel how cold they are: and it was REALLY COLD! "Yesterday's Main Street" takes you on a stroll through Chicago land's cobblestone streets during the late 1920's. They have an old fashioned ice cream parlor in this area. It was super cute, but no where near as cute as Alethea! The "Fast Forward...Inventing The Future" exhibit was fascinating. It examines what life may be like for us in the future. I especially loved this vertical farming model. It was so difficult to get a photo of this. It is a very tall model showing how we can farm up as more people move into urban areas and land becomes more scarce. The "Transportation Gallery" houses historic vehicles that have flown, chugged, and sped into the record books. You can climb aboard this 999 steam locomotive which held the land speed record for decade. Jason was sure to check the train out! You can also go inside a genuine Boeing 727 and learn all about aviation and technology from the inside out. But perhaps our favorite part of this wing was not the large vehicles, but the miniature ones; for in this wing is housed "The Great Train Story"...the largest train set I have ever seen! It is 3,500 square feet (that's about the size of my house! ), uses 1,400 feet of track and has more than 20 trains. The Great Train Story presents 2,200 miles of scenery from the city of Chicago, to Seattle Washington. There are interactive buttons where you can lift a drawbridge, set off tunneling charges, or fell a few trees. We especially liked knocking over the trees and screaming "TIMBER!" 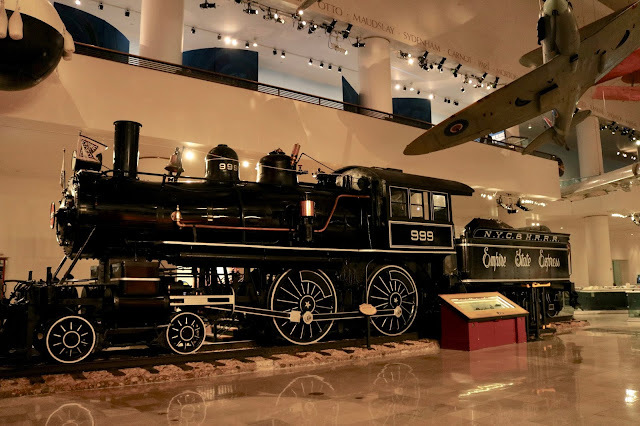 But like everything in the Chicago Museum of Science and Industry, this exhibit is not just for fun and play...there are educational signs throughout the display explaining the railroad industry in certain time periods. I especially loved the city of Chicago portion of this train set. I could recognize and identify most of the buildings! The "ToyMaker 3000: An Adventure in Automation" exhibit was super fun. You can watch a toy (a top) being made by automation from beginning to end! The assembly line cranks out 300 toy tops in an hour...but they slow it down so you can see how the toys are made! 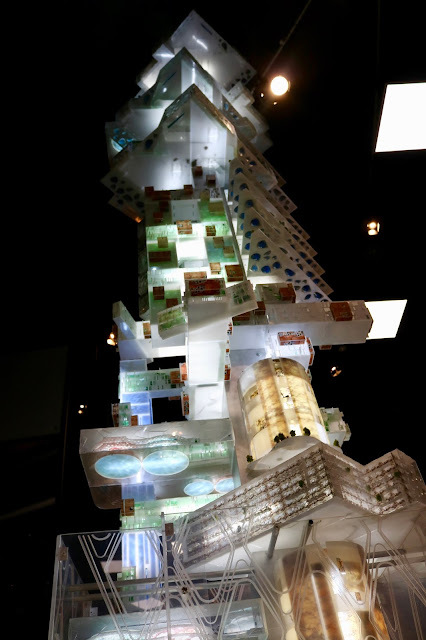 Perhaps one of our most favorite exhibits of all came as a complete surprise to us. It was the "Numbers in Nature" exhibit. This exhibit requires a ticket because of it's popularity. They can only allow a certain number of people in at a time or it could become dangerous in the mirror maze portion. To get a ticket, you just go to the nearby kiosk and print the number of tickets you need for your party. They are free. The tickets allow you to enter the exhibit at a specific time. The reason I liked this exhibit so much was because it really solidified my faith in a creator. I found it fascinating to see all the patterns and numbers in nature and I knew that could never happen by chance or by a 'big bang', but only from a loving, all-knowing God. In this exhibit is the "Mirror Maze". Oh my gosh, it was so much fun! And it was so beautiful. I went through it once, then I went through a second time so I could make a video for you all! Here is my short video as I try to navigate this maze. Sorry, I was so excited I forgot to turn the camera sideways. 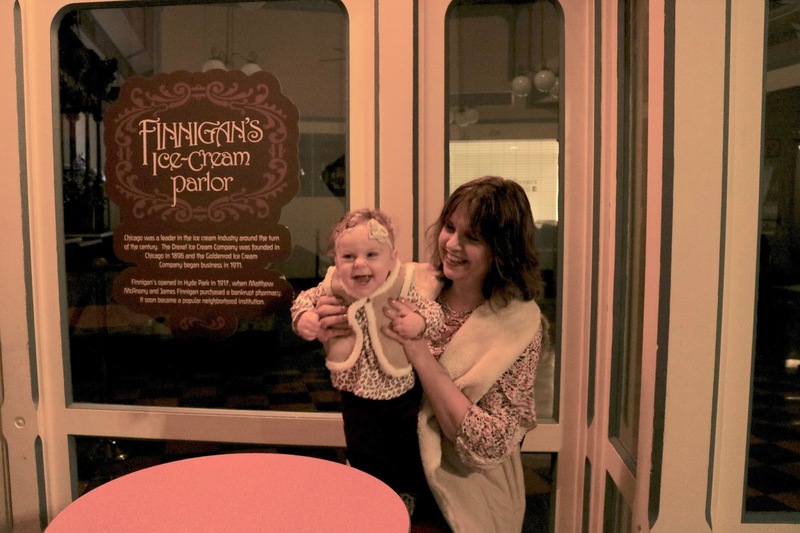 There are so many fun, hands-on experiences to participate in this exhibit. We really enjoyed this "Patterns In You" exhibit which shows how patterns in nature and the man-made world also show up in the human body. The "Genetics and the Baby Chick Hatchery" was a fun place because Alethea got to see baby chicks for the first time! Haha! Just look at her face! She doesn't know what to think! 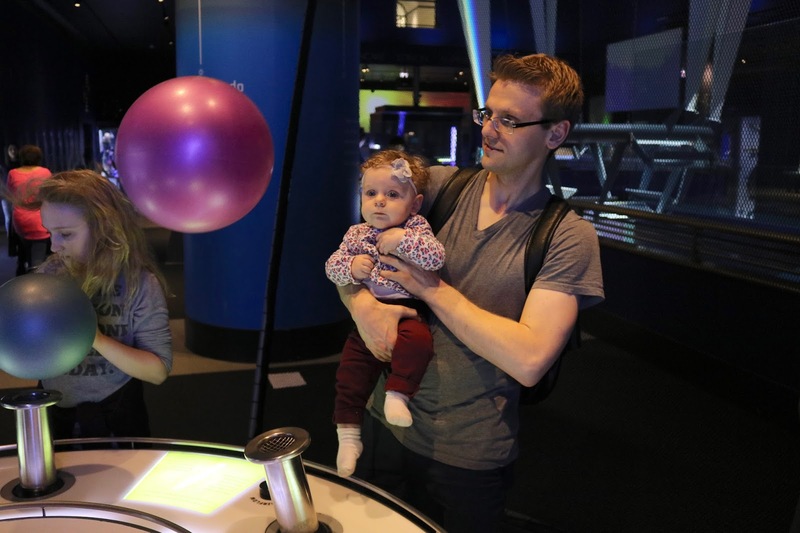 It is in this exhibit that you explore the building blocks of life and learn how the tiniest genetic variations define traits. And perhaps the most touching and meaningful exhibit in the entire museum for me and my family was the "You! The Experience". Housed in this exhibit is the "Your Beginning" exhibit. Here you can view the marvel of human creation. 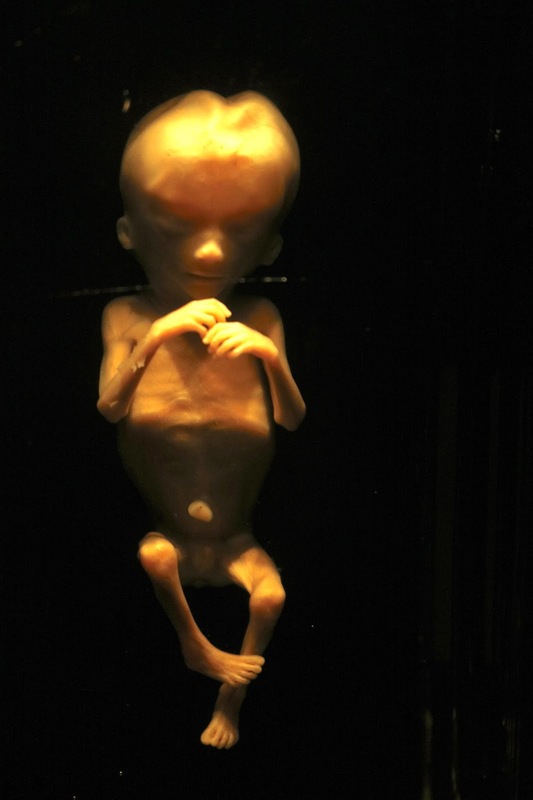 In this room is every stage of human development from a tiny speck at 28 days all the way through a full term baby. 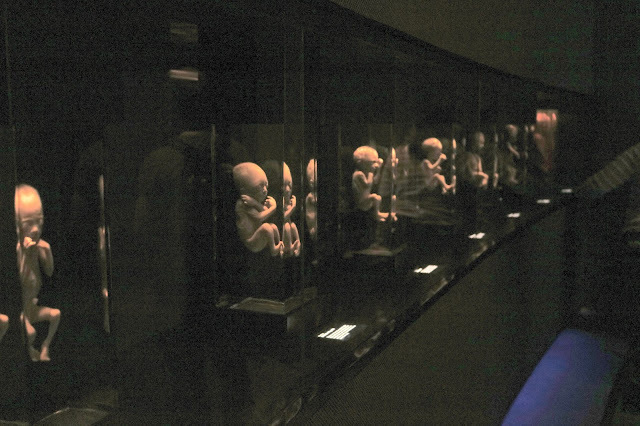 All these babies died natural deaths in the womb and the "specimens" (their word, not mine) were collected for display. When I first walked in this room, a deep sadness overwhelmed me for I knew these were all deceased babies and I felt for the loss of the families. But as I walked through the exhibit, again my faith was renewed and I marveled at how amazing our God is. To see week by week, month by month how God makes a baby in a mother's womb is truly miraculous. Under every baby is a description of the babies development at that age. We were at the museum from the time it opened till it closed and would you believe we did not even get to see everything? It is just so huge, it's impossible to see everything, you really must pick your "must sees" when you first get there. The museum is open everyday from 9:30 to 4:00 with exceptions (see their calendar for the closed days). If your an Illinois resident, there are 52 days out of the year you can get in for FREE! Otherwise the cost for general admission is $21.95. It cost about $20.00 to park your car, and there are lots of extra fees and packages for other exhibits in the museum. We did not pay or see any of the extra stuff...there was more than enough for us with the General Admission ticket. I loved my day at the Chicago Museum of Science and Industry. I felt my faith was renewed and refreshed and I left the museum feeling more in awe of my creator than ever before! If your ever in Chicago, don't miss this museum! Amazing! And so spooky, in commenting on Kellyann's blog which I read just before yours, I googled the spelling of "colleen" (one or two "l"s) and up popped Colleen Moore. Never heard of her before today. So when I read your post I was able to immediately mentally register, Colleen Moore = actress. How spooky!! Hugs, happy rest of week dear Amy, x.
I've been wanting to visit this museum for a long time now. I'm kind of glad we haven't went yet because I think now that my kids are older they would really appreciate it more,and I hope we can visit it soon. Love the train models and how cute is that castle!! We might have to skip the baby exhibit...not sure my daughter and I could get through it without crying. Elli, children of all ages would enjoy this museum as there are exhibits for all ages, but yes, the older they get the more they would enjoy. The baby exhibit was hard. But seeing how life is formed from the time of conception was a beautiful experience. Spectacular pictures! 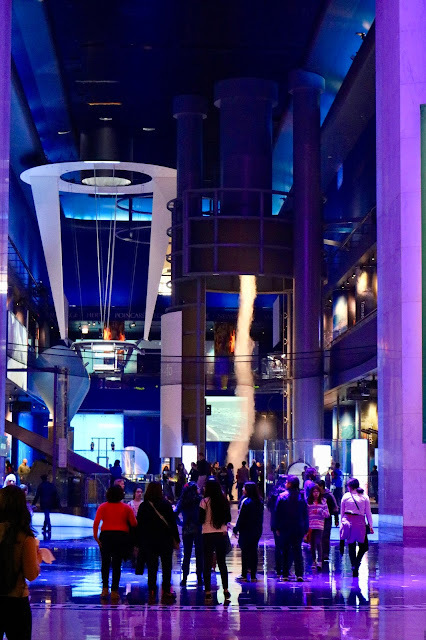 This post make me wanna run to nearest science museum right now, I didn't realize how much I it fascinates me & I miss it, until I saw your post! Thank you! Yes, it's been a long time since I've been to a museum like this. 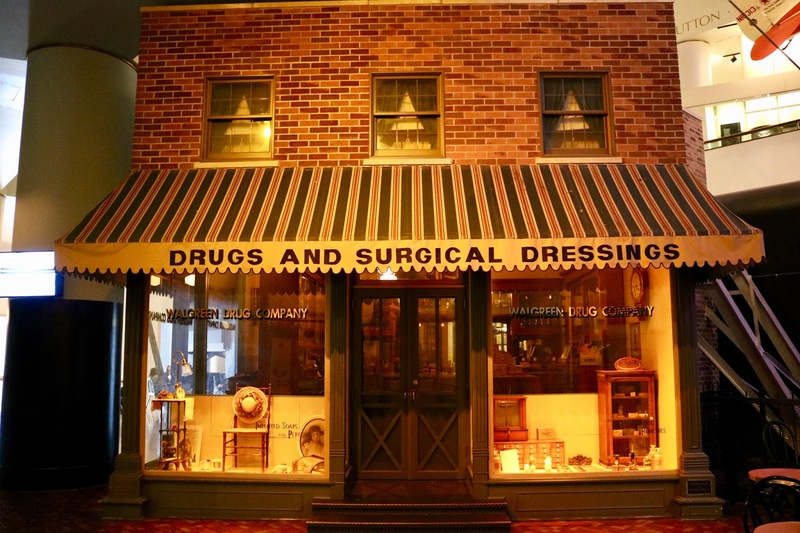 I've been to a lot of history museums when I travel, but nothing like this. It was quite the experience. science museums are always so cool and interesting, and I love that rainbow ceiling. Thanks Cheryl, they are always so cool and interesting. Thanks for sharing this. I am hoping to go to Chicago this spring and have been making a list of things to do. I really want to see that castle! Thanks Michele, if you can only go to one museum, this is the one I would recommend. Unless you really like art, then the art museum is a must-see too! Oh wow! Looks like a totally cool place where I couldn't totally geek out. :) There is one in Washington, DC that I love going to. Thanks for sharing your adventure with us! Thank you! I've been to Washington DC but I don't think I saw any science museum. I did go to the Smithsonian and all the political and historical attractions. What a fabulous museum and so may things to see. I often take my almost 4 year old grandson who just loves the museum especially the dinosaur section. I find it amazing to see 3D images of unborn babies and recently went to my daughter's 20 week scan. It was so beautiful to see my grandbaby before he/she is born. Thanks for sharing your visit with us at #MLSTL. Thanks so much Sue! The dinosaurs are coming to my blog too! 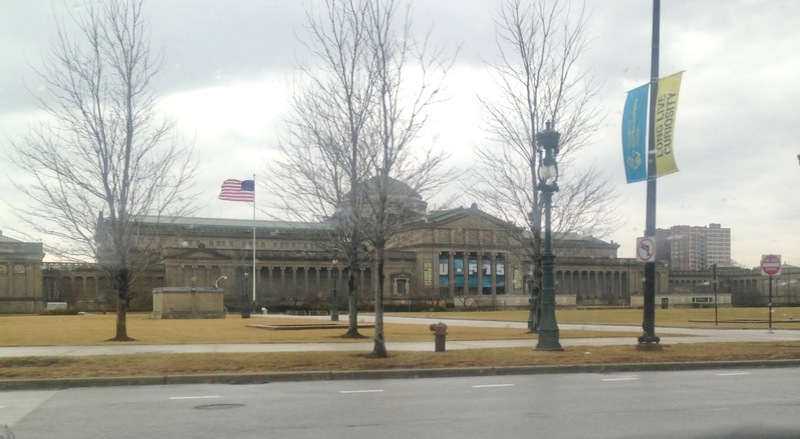 That was a separate museum: The Chicago Field Museum, which I also went to. What a wonderful day. I have only been to Chicago once and that was for a football game. This is such an interesting place though I would really like to visit. Nothing is better than doing things with the grandbaby even if they won't remember.Our God is wonderful and sometimes we do need to be reminded of how great He is. Thanks Victoria! Funny that you mentioned a football game. To get to the museum we had to walk right past Soldier Field and because none of us follow sports, we kept wondering what it was. I googled it on the way home only to find out thats where the Chicago Bears play. Too funny. Thanks so much. The babies were heartbreaking to view, but somehow beautiful at the same time. God is so amazing! These are exactly the places we love to spend the day!!! Along with good restaurants, of course!! I haven't been to the museum in years. I just LOVE Chicago. Thanks Cherie! Chicago is one my favorite cities! We live only 3 hours from Chicago, so you would think we'd go there often, but unfortunately we haven't been there in quite awhile. After seeing the photos and reading about it, I told Mr. Cottage we need to go! Thank you for sharing this! I love Chicago! Isn't that the way it always is? I used to live in Milwaukee and never appreciated all the things big cities have to offer...like museums. Now that I live in the country, I have a different perspective. It's been a long time since we've been to the museum, but the whole family really enjoyed our day there! Thanks for the memories! Thanks Cathy! I haven't been to a museum like this in years myself! That looks great fun. I love the mirror maze. Thanks Lydia! It was fun, especially the mirror maze! Wow! This is a blast from the past for me! I grew up across the Indiana line and visited this museum many times in the '60's. I recognize Colleen's castle and the babies in the jars. I'm glad they still have the hatchery and the hanging planes. Thanks for sharing! Glad I could take you down memory lane! Thank you for joining the Travel Tuesday meme. Thanks Nick! This is my favorite museum in Chicago. I also love the Art Museum. If you ever get back here, I highly recommend it!